It looks like we've made it to the end of the semester! As the year's end is quickly closing in upon us, I thought I would write a post about what the holiday season is like at Franklin. 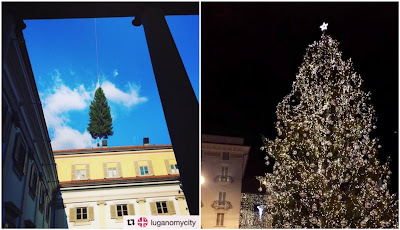 There are many events celebrated here on campus, in downtown in Lugano and throughout Switzerland. A festive atmosphere and reasons to celebrate can help alleviate the stress of final exams and papers before we all go our separate ways for the holidays. The last few weeks have been full of activity, from day trips to Basel to simple celebrations and reminders of what really matters. Keep reading for a recap of what's been happening at Franklin. Hosted by Franklin's Student Government Association, this event aimed to promote a positive environment where students were able to write thank you notes to other students, professors and staff members. 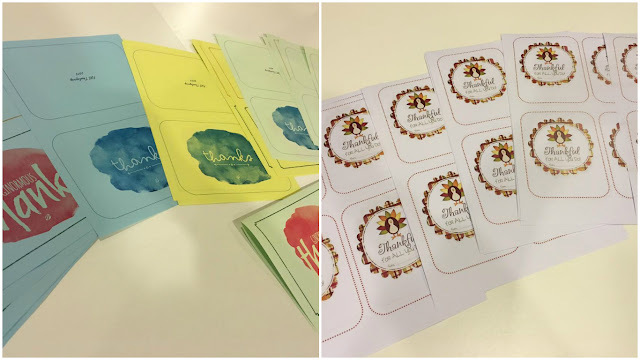 The cards were then delivered to the recipients along with a small treat. An annual occurrence at Franklin, this dinner brought American Thanksgiving to Switzerland. Traditional foods, such as turkey, green beans, and an assortment of pies were served at this evening event in the North Campus Dining Hall. It offered a taste of home for many, and brought a variety of Franklin students and staff together. This was my first year attending the event (pictured before dinner got started). I realized I've been missing out! 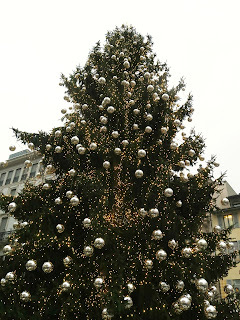 Many, if not most, cities in Switzerland celebrate the holidays by erecting Christmas markets among old-town streets. The stalls found there are filled with handicrafts, regional food products, decorative items, and the ever-popular mulled wine stands. 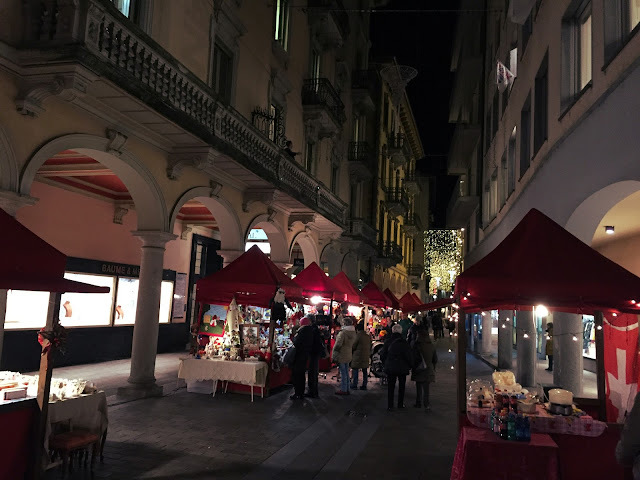 Lugano is no different - its Christmas market is a bustling sight to behold. This huge event brought the people of Lugano together to witness the lighting of the giant Christmas tree in Piazza della Riforma (the tree was brought in earlier by helicopter). There was music and celebration as the lights went on at 18:00, just as full darkness had settled in. Franklin has its own Christmas tree every year, located in Holman Hall. Students got together to decorate the tree while enjoying snacks, hot beverages, and holiday music. The student-decorated Christmas tree in Holman Hall. This student-led trip to see Basel's Christmas Market is another annual event. The Student Government Association sponsors the event, which means that students can attend on subsidized train tickets (Basel is nearly four hours away from Lugano). A new event this year is Franklin Holiday Cheermeister. Held at the Falcon's Nest in conjunction with the FUS Sustainable Agriculture Club, the event promoted sustainability. 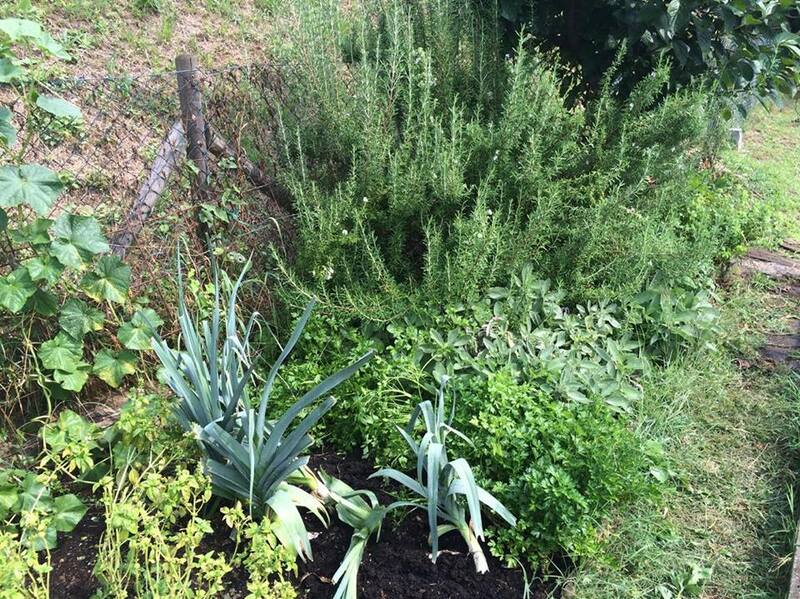 Students were asked to bring their own cups and plates to enjoy drinks and snacks with fresh herbs from the Franklin garden while listening to holiday music. 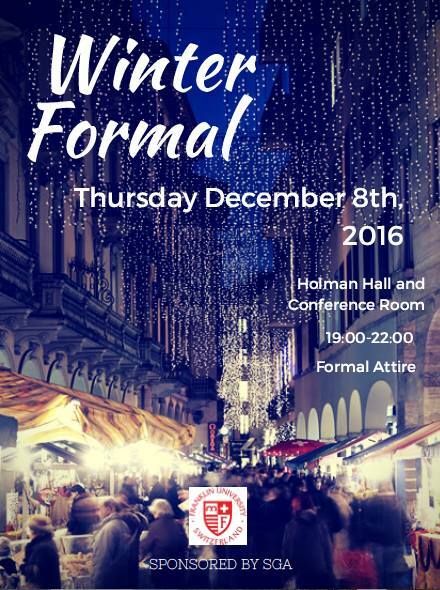 Winter Formal at Franklin is a special event that lets students dress up in their best and relax before finals week. Food and drinks were provided by the Student Government Association. As you can see, it's been quite busy around here! Needless to say, I think most of us are looking forward to winter break. Whether or not you celebrate during this season, I'm wishing you all the best - see you in January.